We will not spam or sell your info to anyone! 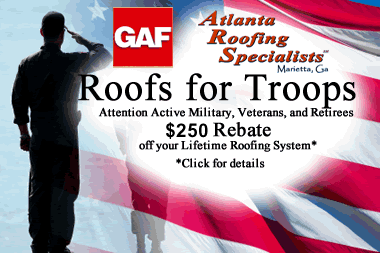 Atlanta Roofing Specialists has been providing specialized roofing services to the Atlanta area since 1993. Over the years, we at Atlanta Roofing Specialists, have built our business on providing the best service possible to thousands of customers. Today, Atlanta Roofing has become an Atlanta's Premier Roofing Contractor serving both residential and commercial customers alike. We offer roof repair, roof replacement, storm damage repair, hail damage repair, insurance claims, commercial roofing contractor services, flat roofing, EPDM roofing, skylight and vent installations, new gutters and gutter covers, carpentry and more. No roofing or gutter job is too big or too small. We believe Atlanta Roofing's roof repair and roof replacement services are second to none and with our flexible payment options from insurance claims to accepting major credit cards** we make it easy to afford that new roof! With an A+ BBB rating, 6 consecutive years as a Home Reports Best Pick, outstanding reviews on various consumer websites such as Angie's List, Kudzu, CitySearch and more, you owe it to yourself to have Atlanta Roofing Specialists give you are FREE ROOF ESTIMATE on your next roofing project. From large commercial roofing to residential roofing you can trust Atlanta Roofing Specialists to get the job done right! * Restrictions apply. Roof inspection and estimates provided at no charge to property owners only, inspection reports or other documentation for others such as Realtors available at additional charge starting at $175. Call for details. **Credit card purchases may to subject to processing charge. Call for details. © 2016 Atlanta Roofing Specialists, Inc. All Rights Reserved.